Are you tired of hearing about how breakfast is the most important meal of the day? Well, this advice probably is not going to stop because breakfast really is an important meal to fuel the body for the day ahead. 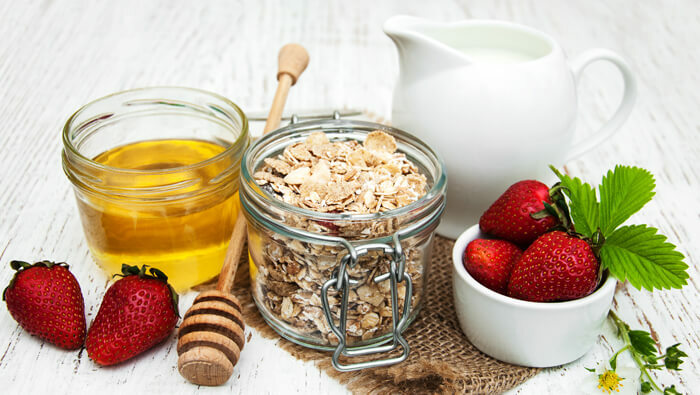 Most popular breakfast choices, however are heavily influenced by grains and dairy, such as cereal and milk, bagels and cream cheese or yogurt and granola. The more processed a food item is, the less nutrition it will carry. With the right blend of ingredients, a smoothie can be a nutritional powerhouse—full of antioxidants, minerals, vitamins, and protein. Blend all ingredients together until combined! Add more liquid if necessary. The French word for perfect is parfait, and when you add whole grains and fruit to yogurt to create a healthy breakfast option. Typically, a yogurt parfait consists of layers of yogurt, grains such as granola and fruit. You can even spice up your parfait with a pinch of cinnamon, or grated nutmeg. Similar to the breakfast smoothie, I like to add a Booster such as flax or chia seeds for added health benefits. In a mason jar place ¼ cup Greek yogurt on the bottom, then add ¼ cup betties and ½ of the ground flax. Layer the rest of the ingredients – enjoy!. If you’ve been looking for a way to make your mornings feel a little less chaotic, making your breakfast the night before is a popular and easy way to make sure you start the day off with a nutritious breakfast. Whole Oats offer a lot of health benefits; they are rich in antioxidants, including Avenanthramides and contain a powerful soluble fiber called Beta-Glucan which can help lower cholesterol levels. Place 1 cup sliced strawberries in a medium bowl and smash them with a fork until they are mashed. Add the rest of the sliced strawberries to the bowl along with the rest of the ingredients. Stir well to combine. Divide between 2 small bowls, mugs, or mason jars. Cover and refrigerate overnight. Enjoy cold, or microwave for 30-60 seconds to enjoy warm! There are so many different variations you can do for this recipe! I get all mine from Pinterest which is great for ideas! Check out our Pinterest page for more ideas! Avocado toast is a calorie-dense breakfast recipe that includes a variety of healthy ingredients, including olive oil, whole grain toast and avocados. A single avocado also contains 10 grams of fiber and a significant amount of vitamin C, vitamin B6, potassium and magnesium. These are all good things—especially the fiber. To prepare, slice and scoop out your avocado into a bowl. Then, pour half of your olive oil and lemon juice on top. Mash with a fork until it is chunky, not smooth. Add all of the spices and mix with the fork. Top the avocado toast with the remainder of the lemon juice and olive oil. Offering a satiating combination of protein, carbs and fats, totally customizable energy bites are the perfect fast, nutritious snack or breakfast option. This recipe for bites is my favourite, but there are so many more to try! Again, check out our Pinterest page for more ideas!